We get a large number of enquiries to the Skills Platform about the Care Certificate, so thought we'd put all our responses together in one place to help everyone interested. There's clearly some confusion still around about the Certificate, so we've tried to make this guide (mostly) jargon free. If you still have questions after reading this, let us know and we'll add them to the list! What are the Care Certificate standards? How did the Care Certificate Come About? Do agency staff need to achieve the Care Certificate? Care Certificate – How, what, where, when? When would someone aim to achieve the Care Certificate? Do you have to re-do the Care Certificate if you change jobs? Does the Care Certificate replace inductions? What are the benefit of the Care Certificate to the health sector? What are the benefits of the Care Certificate to individuals? How do we know if the Care Certificate is making an impact? What if you’re not happy with the level of care in your organisation? Who can assess achievement of the Care Certificate? I want to become a Care Certificate assessor, what should I consider? Can a training provider award the Care Certificate? Are there any training providers ‘licenced’ or ‘accredited’ award the Care Certificate or associated training? Can you achieve the Care Certificate from eLearning alone? What if you are highly experienced? 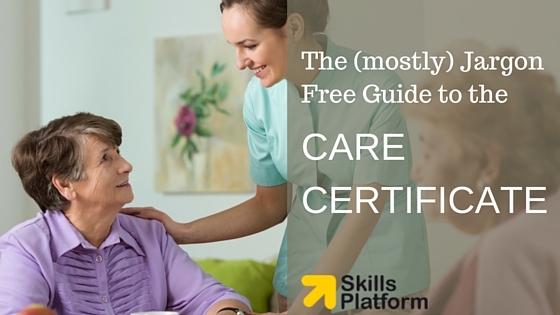 Are there free Care Certificate resources available? 1. What is the Care Certificate? 2. What are the Care Certificate standards? Each standard has associated learning outcomes and assessment criteria. 3. How did the Care Certificate Come About? 4. How is the Care Certificate Awarded? The Care Certificate is awarded by the employer on completion of the both the skills and knowledge aspects of the 15 standards. Employers can award their own certificate with templates available here. 5. Who is the Care Certificate For? 1. Is the Care Certificate mandatory? The Care Certificate isn’t mandatory per se, but there is still a requirement. The Care Quality Commission will look to ensure that whatever the organization is doing with its training that covers the requirements of the Care Certificate. 2. When would someone aim to achieve the Care Certificate? Ideally someone would aim to achieve the Care Certificate when they first start work as a Healthcare Support Workers or Adult Social Care Worker. There is no fixed time for when someone should achieve the certificate. However on average it takes 12 weeks to achieve the Certificate full time staff, so starting sooner rather than later is recommended. 3. Do you have to re-do the Care Certificate if you change jobs? No, the certificate is designed to be portable. If you change jobs or take on a new employee, if they have completed the Care Certificate elsewhere, you do not need to achieve the Certificate again. Employers are expected to help staff retain their knowledge and competencies. 4. Does the Care Certificate replace inductions? No – The Care Certificate might cover some parts of an existing induction, but all organisations will have particular needs that the Care Certificate will not cover. 5. How long does it take to complete the Care Certificate? The average time taken for a new employee to demonstrate the expected competences and knowledge is 12 weeks. This may vary according to the training needs of each individual and the resources available to employers. 6. Do agency and bank staff need to undertake the care certificate? It depends on their experience levels. Providers of health and social care have a legal duty to assess the training needs of all staff new to their organisation; this applies to agency, bank or directly recruited health and social care assistants. This assessment may indicate that a new member of staff needs to receive training in all, some or none of the care certificate standards before providing care unsupervised. 1. What are the benefit of the Care Certificate to the health sector? The Care Certificate means that every support worker, irrespective of where they're working should have a common standard of initial training. If you're working in an orthopaedic ward as your first job, then you'll have done the same minimum training as somebody working in a learning disability care home. The learning that the worker does as part of the rest of their induction sits on top of the Care Certificate. 2. What are the benefits of the Care Certificate to individuals? The Care Certificate ensures that a support worker’s career starts off with the right foundations for learning and development. The Care Certificate aims standardize that beginning part of the journey. More than this the Certificate aims to make people feel valued. 3. How do we know if the Care Certificate is making an impact? There is a longitudinal study being undertaken that will look at the longer term impacts, whether it's increased retention of support workers, whether it's support workers progressing into more advanced learning like the apprenticeships at level two or level three, and just whether generally people feel more satisfied with their job and field. That they are better prepared for the jobs that they are being employed to do. 4. How do you assure the quality of the Care Certificate? Employers are responsible for assuring the quality of the teaching and assessment of the Care Certificate. 5. What if you’re not happy with the level of care in your organisation? All health and social care providers must provide people with information about how to make comments and/or complaints about any aspect of care. More information about how to complain is available on the Care Quality Commission website. 1. Who can assess achievement of the Care Certificate? The assessor can be anybody who is competent both in the skills and the knowledge of the competencies is being assessed, but also, there's an expectation that the person will have had some training in being an assessor. There are no specific qualifications required for this as it varies from employer to employer. Download the Care Certificate assessor framework here. 2. I want to become a Care Certificate assessor, what should I consider? Being an assessor isn't something that anybody should take lightly. It's a serious thing. You're making a decision on whether somebody is competent and therefore in this particular. Download the Care Certificate assessor framework here. 3. Can a training provider award the Care Certificate? No – Employers may use a training provider to deliver the teaching, learning, and provider may provide some assessments. Ultimately though, it is the employer who awards the Care Certificate, because only the employer can assess work based competency. 4. Are there any training providers ‘licenced’ or ‘accredited’ award the Care Certificate or associated training? No – No provider has been ‘licenced’ to award the Care Certificate. Such a licence does not exist. No providers are accredited to deliver the Care Certificate. See the joint statement on the Care Certificate here. 5. Can you achieve the Care Certificate from eLearning alone? No - It’s best to see the Care Certificate as a combined demonstration of Skills and Knowledge. eLearning will help with the knowledge aspect, but competencies still need to be demonstrated in the work place. See the joint statement on the Care Certificate here and our article on Care Certificate eLearning here. 6. What if you are highly experienced? If you've been working for a number of years, it's expected that you should already have the competencies and knowledge that's outlined. This should therefore fast track your completion of the Care Certificate as the employer may be able to easily record a demonstration of competencies in the work place. 7. Are there free Care Certificate resources available? Most certainly, there are a number of free materials and workbooks available here. The workbooks have recently been updated based on user feedback. Find more Care Certificate downloads here. Using the Skills Platform, you can search for Care Certificate eLearning courses here.